Biryani is a layered rice dish made with meat or vegetables and spices, usually prepared with basmati rice. Making biriyani the authentic way can be a quite time-consuming and laborious process. 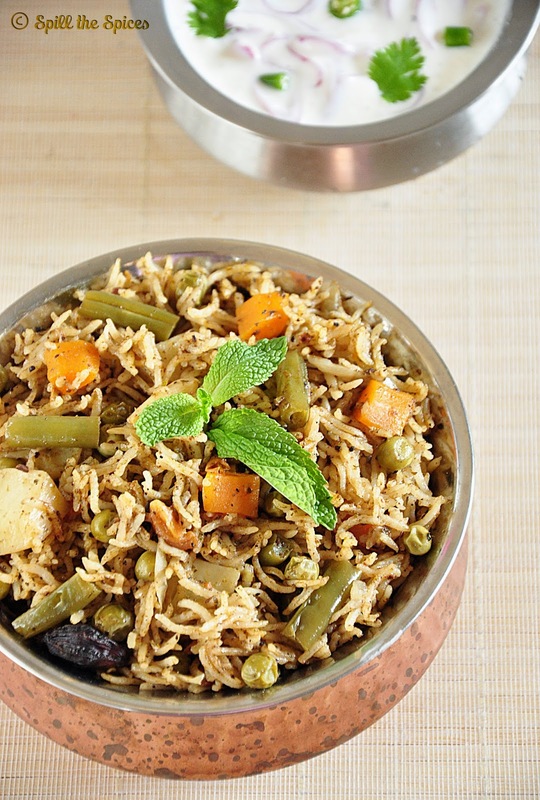 So here is an easy, quick and hassle-free vegetable biriyani cooked in a pressure cooker, with no compromise on taste. I rarely make the dum style biriyani as it's an elaborate process. 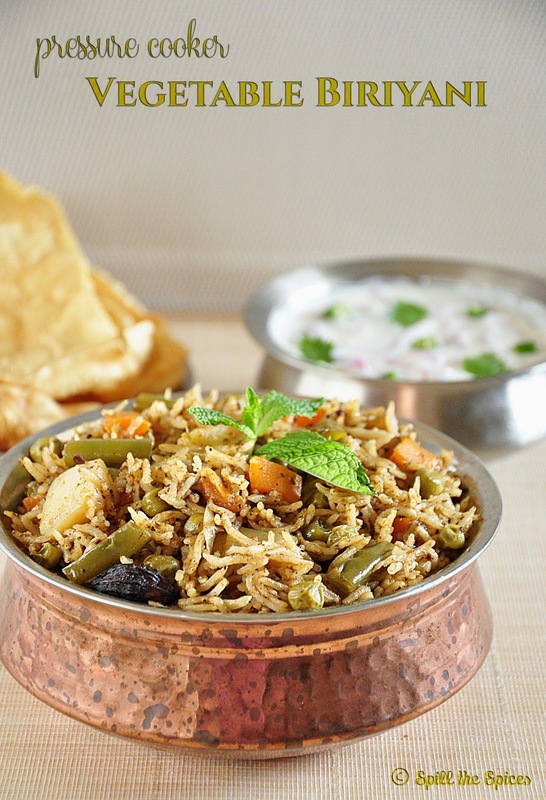 Whenever we are in a mood for biriyani, I prefer this simple one pot biriyani. The amount of water and cooking time is crucial while cooking in pressure cooker, else the rice may get overcooked and mushy. After few trial and errors, I finally succeeded in getting perfectly cooked rice. This biriyani can be packed for lunch box too. 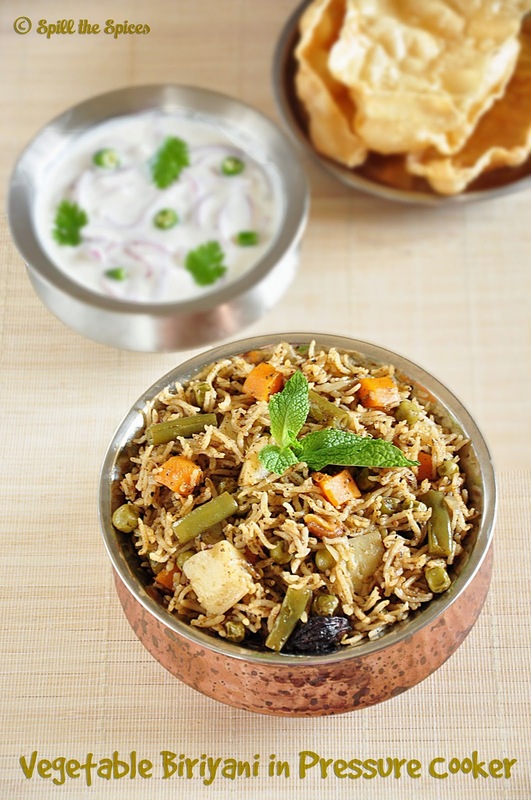 Serve this spicy biriyani with raita and papad. 1. Grind mint, coriander, green chilly, garlic and ginger to a coarse paste without adding water. Set aside. 2. Cut potato and carrot into small cubes. Cut beans into 1-inch long pieces. 3. Wash basmati rice and soak in 1 ½ cup water for 30 minutes. Drain and set aside. 1. Heat a heavy-bottomed pressure cooker with oil and ghee. Add bay leaf, cinnamon, cloves, cardamoms, star anise and fry until nice aroma comes. 2. Add onion and saute until they turn soft. Add the mint paste and fry for 2-3 minutes. Then add tomatoes and fry till they turn mushy. 3. Now add the vegetables and fry for a minute. Add yogurt, biriyani masala, red chilly powder and mix well. Fry for 2-3 minutes. 4. Add rice and gently combine. Add 1 ½ cup water, salt and mix well. Bring to boil and close with the pressure cooker lid. 5. Pressure cook on high heat for 1 whistle, then reduce the heat to low and cook for another 5-6 minutes. Once pressure subsides, open and fluff rice gently with fork. Serving Suggestion ~ Plain yogurt or raita and papad. Adjust the amount of green chillies and biriyani masala according to your preference. Soaking the rice reduces the cooking time and gives longer grains, so do not skip it. You can finely chop mint, coriander, green chilly, garlic and ginger, instead of grinding. easy one pot biryani!! yummy and flavourful!! love those pixel crisp long grains!! tempting! love this one pot biryani... flavorful biryani..
Vaayil kappalodikkanulla vellamundallo Sona... slurp!!!! Perfectly cooked biriyani, looks so flavorful and delicious. Bookmarking this one. Looks so perfect, an all time favorite..
Tasty Biryani with mouthwatering pictures Sona. Love it. This looks as good as a dum biriyani.. Super clicks and recipe dear..
Flavorful and delicious looking biryani... looks so yummy and tempting dear. Delicious Biriyani.. this is a regular feature in our house. delicious looking biryani. I too don't do the dum method. It takes too long. I agree with you its best to soak rice for a while to get long grains.